After Facebook moved into east Menlo Park in 2011, long-term residents started moving out, said Sandra Zamora, a resident who is facing displacement after her rent jumped by $800 a month. Zamora’s complex at 505 Pierce Road, along with three other small complexes in the Belle Haven neighborhood, were bought by Redwood Landing/Menlo Gate LLC, which is raising her rent from $1,100 to $1,900. It’s a hard increase to swallow for the 29-year-old preschool teacher who works at a restaurant on the weekends and goes to school at San Francisco State. No one from Redwood Landing/Menlo Gates LLC returned the Post’s multiple messages over the past week for their side of the story. “To pay the $1,900 and other living expenses, I’m barely meeting the needs of eating, living and everything else. It’s not a life,” Zamora said while seated on a couch in her roughly 430-square-foot apartment. While Zamora has been living on Pierce Road since 2007, Teresa Rivas, 63, has been living next door at 513 Pierce Road since 1992. Rivas, a housekeeper, lives in a one-room apartment about the same size as Zamora’s. And she has a roommate. When she first moved into the apartment rent was $450. When the $1,900 rent increase goes into effect, her rent will have gone up 322% since first moving in 26 years ago. Rivas said she thinks that she and her roommate have enough saved up in order to live at 513 Pierce until January, but that would eliminate her savings. “I’m sad because I’ve lived here for more than 20 years, it’s a big part of my life. I have my job and doctor in Belle Haven … I don’t know how I’d feel in another place, in another city,” Rivas said. Eisabel Coronel, 48, who lives in the same complex as Zamora, has raised her two children, 10 and 24, in the Belle Haven, and has lived at the Pierce Road complex for about 14 years. 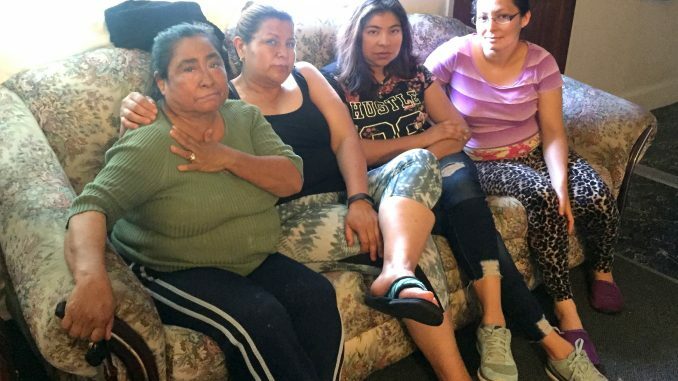 Coronel said she won’t be able to stay at the apartment for much longer, and just like her neighbors, is constantly looking on Craigslist for something her family can afford. But Coronel is worried about how the move will affect her 10-year-old daughter, who will likely have to change schools and leave the area she’s known her entire life. The residents of the complexes bought by Menlo Gate have received some help from East Palo Alto Community Legal Services, which was able to get a two-month delay on the rent increases. Legal Services also convinced Menlo Gate to pay $1,000 in relocation assistance if tenants decide to leave before the rent hike goes into effect on Aug. 1. Legal Services has received $500,000 in funding from Facebook. But attorney Nazanin Salehi said that no matter who funds the service, it won’t stop the organization’s attorneys from fighting on behalf of those being displaced by the growth in Menlo Park and East Palo Alto. Zamora and her neighbors have given up hope that the new landlords will help them even more. So they’ve set their sights on Facebook, with Zamora posting an open letter to CEO Mark Zuckerberg on Facebook on Thursday. “Right now there are many families that have been displaced and many more waiting to become homeless because there is not rent control in Menlo Park and because Facebook has affected the most vulnerable communities in east Menlo Park. These families work two or three jobs just to keep up with basic needs,” Zamora wrote in the letter. Facebook, which is seeking city approval to build its massive Willow Village project, is proposing to build 1,500 homes, with 225 homes being reserved for low-income earners. Facebook has also subsidized rents for 37 apartments in the Belle Haven and put $18.5 million in a fund aimed to create low-income housing in East Palo Alto and Menlo Park. By comparison, Facebook has 15,000 employees working in Menlo Park right now. Within 10 years, the company expects to have 35,000 employees, more than the city’s current population. Rents have been rising in east Menlo Park for a couple of reasons. The most obvious is that Facebook moved from Palo Alto in 2011 and is expanding its footprint. Another reason is a new zoning plan for the east side has opened up the area to developers. Scott Safadi, of downtown Palo Alto-based Cal Bay Property Management, has dealt with situations like this in the past. He said that when a new buyer purchases an apartment building, the building’s price is typically based on what a landlord would be getting if all of the units were renting at market rates. So if someone is selling an apartment complex where the rent is $1,500 but the market rate value for the apartments is $2,500 — the building will be priced by a broker as though the apartments were generating $2,500 in rent. The new owners need to raise the rents in order to at least have enough to pay off the loan they used to buy the property, Safadi explained. “The guy who sells the building wants as much as possible from the sale. And so the buyer says, ‘I need to get as much rent as possible to make up for this purchase,’” Safadi explained. 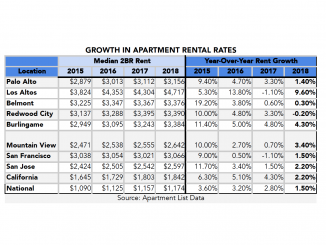 Safadi, who does not manage any properties in east Menlo Park or East Palo Alto, said the only time he’s managed a property where there was a large rent hike, turnover was minimal because the increase was phased in over nine months. As for the 20 tenants of 505 and 513 Pierce Road, along with those at 1103 Henderson Avenue, at least seven have left, with most of those remaining at the complexes reviewing their options, according to Salehi. Such a sad story. You’d think Facebook, with billions in profits, could be helping them. If Facebook had stayed in Palo Alto, this wouldn’t be happening. As expected, the mass migration elephant in the room is ignored. You know what would help with affordable housing “crisis” in the Bay Area? Deport 1 million illegals, yank the H1-B and related scam visas to thousands more, force greedbag companies from Facebook down to local contractors and restaurants to hire AMERICANS and pay them well. No one has the right to immigrate to (or illegally invade) the United States and milk it (the American middle class) as their personal welfare cow, despite what communist Mexican presidents-elect say. Why do these sob stories always focus on Mexicans and not black Americans in East Palo Alto for example?